This is a great book, Got to know how things (corporates) in the world operate, There is a lot about India. A perfect book. Drive-By ReviewAccurate picture of how the global economy is evolving, and how our skills are going to need to change to keep up. I had to read this book for a MBA class and wanted to beat my head against the wall the whole time I was reading it. Dryly written..it couldn't keep my interest for anything and I found myself having to go back and reread sections because I zoned out while reading them the first time. I tried. I read through 1/2 the book when I finally realized, I didn't care anymore. It was interesting the first 1/4 of the book and then I just started to lose interest. 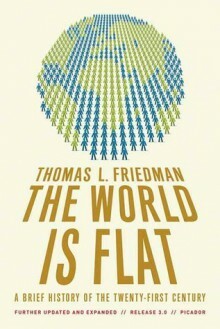 Mr. Friedman's writing style is humours and easy going. Good points - just not to keep my attention.